Supply chain segment is at a booming stage. While it may not be possible for many stakeholders and supply chain business owners to get hold of experienced and specialised manpower to cater to their business needs, they can always involve a virtual assistant to give them a helping hand wherever needed. Virtual Assistants are so named because they are virtual. They could be either automated applications, artificial intelligence driven machinery or a person working from a remote location. Virtual Assistants are freelancers who look after sections of your business as and when the business requires. The benefit of having a Virtual Assistant is that they cost you much less than a full time employee and allow you the flexibility to deploy them only when you require. They take the workload off areas where extra focus is required. A single Virtual Assistant can be engaged to carry out diverse activities or multiple Virtual Assistants can be hired to undertake diverse operations. This is entirely on the requirement of the supply chain operations manager. Supply Chain Management is a widespread operation. The production centre and the product delivery destination are often situated thousands of miles apart. It requires immense coordination between different channel partners and supporting departments. Skilful professionals are required at different levels and at different stages. Due to its diverse functions, the supply chain segment in any industry requires varied workforce ranging from supply chain managers to contractual labours. With the growing demand in supply chain operations, it is becoming increasingly difficult to find apt manpower to manage the supply chain functions. Virtual Assistants can be the right answer in such a scenario. Procurement: Virtual Assistants can be used to place purchasing requests, follow up orders with clients and speak to suppliers. They can also assist in setting and sending instructions on quality, safety and legal compliances. Data Analysis:Virtual Assistants can be hired to generate and prepare daily, weekly and monthly reports. Such reports provide supply chain managers and stake holders with workable data and business insights. Inventory Control: Virtual Assistants can keep a check on the inventory, product perishability, supply trends, demand supply ratio, etc. They can manage the warehouse operations and follow up dispatches and stock in hand to inform production requirements to the supply chain managers. Communication: Virtual assistants can be engaged to support in communication with prospective clients or handle delivery queries. They can work as a communication centre with suppliers and supply chain managers. They can negotiate shipping prices, finalise freight rates, research on import and export compliances. 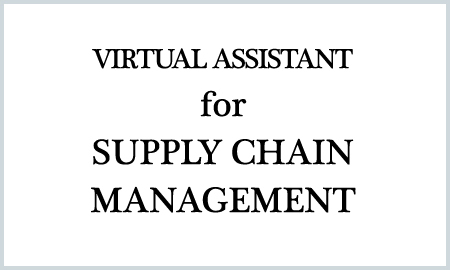 Indulging a Virtual Assistant is a smart option for the supply chain management function because it offers the option to select specialised manpower for specialised work demands. This allows expertise at every level which is difficult to attain with limited full time employees. They help in day to day tasks personally and commercially without having full control of the output. Virtual Assistants are cost effective and help in increasing productivity by optimising operations.